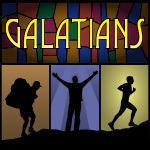 Look again at Galatians 3:1-14. What words and phrases does Paul use to describe the contrast between faith and works? Talk together about some ways you have experienced the curse (see 3:10) of trying to become justified by your works. In verses 2-5, can you find three evidences of what happens in the life of a person who has embraced the Gospel? Talk about which of these you have personally experienced.